Tomorrow is World Suicide Prevention Day, and to raise awareness, the International Association for Suicide Prevention is hosting their fourth annual Cycle Around the Globe event. Because of the importance of this, I'm going to let their words speak for themselves. The below is from their website, which you can find here. Cycle Around the Globe is an inclusive and inspiring annual event hosted by the IASP on World Suicide Prevention Day, Sept 10th. This Cycle event signifies the joining together of people from across the world, and all sectors of society, in unity, to raise awareness of suicide in theirs and the global community through individual and group cycle events. Through the Cycle Around the Globe we share the message that suicide is preventable. This is the fourth annual event. Each year individuals and organizations across the world cycled, and in some cases walked, to raise suicide prevention awareness. The total distances reached was almost six times the circumference of the globe! 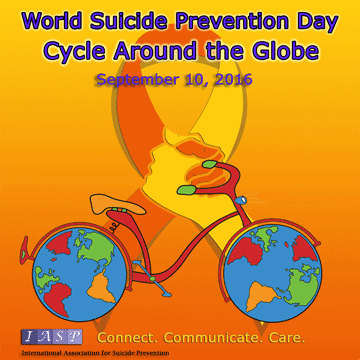 Following last year's success, IASP is again this year hosting Cycle Around the Globe for World Suicide Prevention Day. Again, the challenge is to collectively cycle the circumference of the globe, 40,075 km or 24,900 miles, and to have participants cycling on every continent. We are hoping, though, to exceed last year's distances. Please join us; it does not matter how far you can cycle; every kilometer or mile will help and there are no limits, you can cycle at home, in the gym or outdoors. This activity is all about the global community spreading awareness of the importance of suicide prevention. This year's theme for World Suicide Prevention Day is Connect. Communicate. Care..
You may wish to take this opportunity to raise money for your local or national suicide prevention charity or similar organization. A sponsorship form will be made available to help you collect donations. If you wish to donate to IASP, all donations would be gratefully received. An Official Participant label, which can be printed off and attached to your top whilst you are cycling, and a Certificate of Participation, which you can also print and fill in once you have completed your cycle will also be made available. Please check back again. This is a great opportunity to spread the word of suicide prevention. We will have WSPD banners and Light a Candle postcards in many different languages on our website www.iasp.info/wspd, which can be printed and handed out, as well as lots more information on World Suicide Prevention Day. We will, of course, be spreading the word on social media as much as possible. Please let us know how you get on, send in your photos and confirm how far you cycled and we will try to put together a total distance. We would also appreciate your support in promoting the cycle. Please tell others about the activity and encourage them to join in and, if you use social media please feel free to spread the word. Join us and Cycle for WSPD and show the world that we are all connected in the aim of preventing suicide. Me again. Thank you for helping us raise awareness for suicide prevention. Always remember, if you or someone you love is in crisis, you can always call the Lifeline at 1-800-273-8255, 24/7 and someone will be there to help. You're worth it.